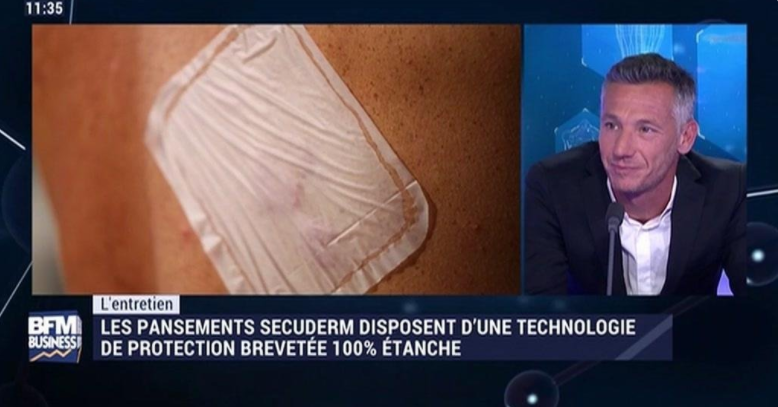 Watch the “Check Up Santé” interview on BFM Business dedicated to Secuderm. It is true that we all used homemade remedies to avoid a dressing to get wet: plastic bag, tape, etc. Is this the kind of experience that inspired you to create your company? Absolutely. I myself had a couple of surgeries. The medical advice was always contradictory: a waterproof dressing, but 2 weeks with no shower. So in secret, I used a plastic bag or plastic wrap to be able to take a proper shower, sometimes even as a tourniquet. The idea was then to offer an efficient solution using a medical device. And it did not exist then? So you created the company called Secuderm. You always say that you are an engineer without any diploma. I do have a degree in fluid mechanics and a management degree. So indeed, I do have an engineer profile but not the diploma. You then started this great adventure in 2005 I think? And where you are located? In Aubagne, near Marseille in France. Indeed, with an international patent. I had the idea to protect the wound’s dressing with an adhesive gel that goes directly on the skin, around the dressing, and then to place a non-adhesive film cut-to-size on top of it. Did you start alone? I guess some engineers or Doctors helped you in this adventure? From the beginning, I closely worked with the Marseille Pharmacy University to identify the raw materials that would be used. I also worked with a design office. And you had some financial help? From the local government or some institutions maybe? I benefitted from a loan from a local association; so, in the beginning, the funds were quite limited. Then I received some financial support from some angel investors. And now, I do have some private investors, who are also advisors with whom I do have a strong relationship. I would like to pay tribute to my first advisor. He was more a supportive assistant to me and he was the doctor who performed my surgeries. His name is Jean-Pierre Francheschi, Past President of the French Society of Traumatology, who died very recently, and this affected me very much. It indeed touched the whole profession. He is the one who gave me these scars and was the first one to support this crazy project. Tell me more about the product. This is the only one in the world? Yes, this solution is internationally patented. We are currently working on developing Secuderm internationally. Does it cost a lot of money to have an international patent? It does. The first cost was around 5000€ and it increases year after year. Depending on many criteria I think? Exactly. Depending on the country, the number of countries and the duration. How does this dressing work? It is a protection. The idea is to cover the existing dressing and to protect it. You apply a gel around the area you want to protect, that can be a compress, or a medical device for example. There is then a closed circle of gel around the wound. And we then apply a non-adhesive polyurethane film on top of the gel. So it is applied on top of a dressing? Yes, or on top of some cream, a medical device, or a catheter. Today, some people can swim for the first time in their life thanks to it. This gel is really waterproof? It makes the dressing watertight? It is really watertight, because we do create another dressing on top of an existing one. We do apply the gel and the film in two steps. The gel is fluid, so it gets into each skin fold. This is the significant difference between our product and the existing fully-glued protection. The film does not stick to the existing primary care wound on the skin? It goes on top of the wound, scars, around a catheter you said? At first I thought this was a solution for post-operative care, which is what I personally experienced at home. It has been validated by the French Navy Doctors on special forces divers with successful results which proves that the product is really waterproof. Then, some patients came to me with some innovative ideas, for example for catheters’ protection. As I said earlier, some children can sometimes swim for the first time in their life. But not only children I think? And even deeper? Indeed, in complete immersion with no worries and no thoughts while swimming. Being liberated. But it also can be used as protection for pressure ulcers’ care. As we do know, there is a problem with other dressings that do not hold sufficiently on sacrum pressure ulcers advanced wound. Secuderm is the solution for this kind of situation. And it is also efficient on skin folds or difficult zones? Yes. At first, I created it for elbows and knees. And this is really waterproof? It seems you won some prizes and awards? I am the winner of the “Boldest entrepreneur 2017 award” from the “Réseau Entreprendre”, I also won the “Graciousness award” from CGPME 13, and an “Innovation trophy” as well. And I was nominated for an award in New York, thanks to an initiative of Business France and Galien Foundation, called MedstartUp. What about the evolution? You mentioned a connected dressing. What does this mean? Does it tell you when it is not tight anymore? Maybe later. But we have a global Secuderm vision. We are the only ones providing a secure protection not only against water, but also bacteria, dust, etc. Over time, we can have different things on the wound: a cream, a treatment, a compress, or a specific technic dressing. The idea is to keep the Secuderm protection on and still be able to know what is under the protection without removing the product. The information could be sent to a device, which keeps track of the primary dressing’s origin. This is the idea we want to develop and indeed include some sensors later. The idea is, I guess to also get into the market of home care? Secuderm is an interesting tool for hospital services and can reduce the number of bandage changes because the wound is protected. For example, for pressure ulcers’ primary care, many changes must be made along the day. Secuderm allows only one change. So you’re business model is evolving? At first, the company was at risk because it was a single-product based business. But Secuderm is a real technology, that can be customized within different shapes and sizes. Depending on the market and on the uses, we do offer our partners a tailored solution totally dedicated to their clients.